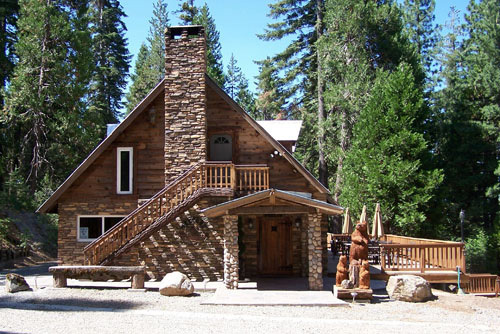 Paradise Springs Bear Cottage – Cozy Luxury! This adorable little cottage has one bedroom and one bathroom. 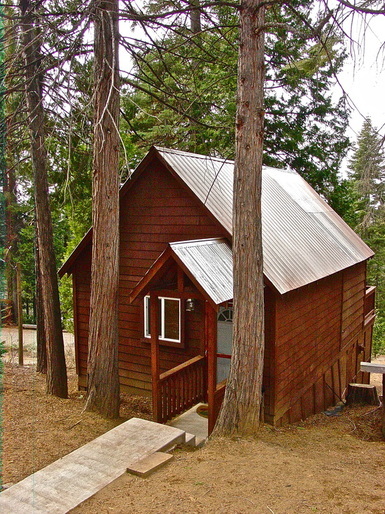 It sleeps four, just perfect for a family or just a couple. Amenities include a full service kitchen, a satellite television with DVD and VHS player, sofa sleeper, and small deck with patio furniture and barbecue. Enjoy your morning coffee from the small deck of this beautifully furnished cozy mountain retreat, relax to the gentle sound of the wind blowing through the trees overhead and get away from it all. This lovely cottage gives your the intimacy, comfort and quietness you deserve. We look forward to pampering you in the Bear Cottage. Amenities Bear Cottage – Amenities include bed & bath linens, toilet paper, Satellite TV with DVD/VCR, propane bbq (propane provided), 4 burner stove, oven, microwave, 10 cup coffee pot (basket filters), blender, refrigerator/freezer, dishwasher, pots, pans & serving utensils, bowls & serving trays, cheese grater and more….plus table settings for 12 – dishware, glassware, silverware. 5/26-28/2012: Two families had a great time here! 8/10-13/2012: We had a wonderful time staying in the cottage while we attended our grandson’s wedding. This is a beautiful location – hot, but that’s the breaks! – J & T McNally Paradise Springs notes: This was during a heat wave.